Simply put... You get hyperlocal insider knowledge from 30 years of real estate in Portland, Maine, and an international understanding gleaned from growing up as the daughter of a US diplomat. and learned from an early age how to make friends. This is what she particularly enjoys with each client, "It is what drives me the most, the privilege of being allowed into personal lives, and satisfaction when I help them achieve their real estate goals". Luxury clients have different needs than other clients, many times due to the complicated interwoven international nature of their investments. how it is being impacted by global markets and of course national markets. Deborah recently attended The Institute of Luxury Home Marketing training in Santa Cruz, CA where she learned the latest techniques for marketing Luxury property where she learned how to write ad copy an entirely new way as well as the importance of communicating the details in these extremely large and multifaceted properties. In addition, how to stage an 'invitation only' event for new listings with maximum dramatic effect. Recently an invaluable tool that has been added to our marketing efforts is Proxio, a unique global marketing and listing service. Deborah lives in a very special waterfront community near The historic antique village of Yarmouth, 20 minutes from Portland. Her waterfront community, Seaborne, has its own harbor and the neighbors take turns being harbor master! Deborah and her husband Sam live in an architect designed home, with views of nature and Casco Bay from every window. They both enjoy their Grady White 25 exploring the islands of with their grown children and grandchildren. Deborah is a graduate of the University of Maryland with a BA in Government and Politics and has studied at Santa Clara University in CA. Deb is a past president of the World Affairs Council of Maine and a graduate of the institute of Civic Leadership(RHO class), a nine month leadership intensive. 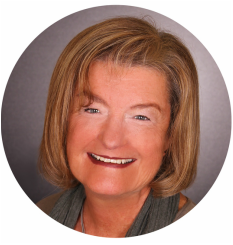 Deb also holds the coveted CRS designation as well as the Realtor GREEN designation and is a member of the KW Maine Portfolio Luxury group. Deb has earned the prestigeous Certified Luxury Home Marketing Specialist (CLHMS). There are less than 60 Realtors at the time of this writing in the State of Maine with this designation and access to member-only tools and resources. This group is really important to the success of marketing luxury properties. Peer consulting makes it a " win win" for all. Deb and her husband are members of the Cumberland Club, a historic city club in Portland that has been open since the civil war, and the Woodlands Club in Falmouth. Sam and Deborah love to travel internationally and last summer attended weddings in London and Stockholm and their own daughters wedding in DC.